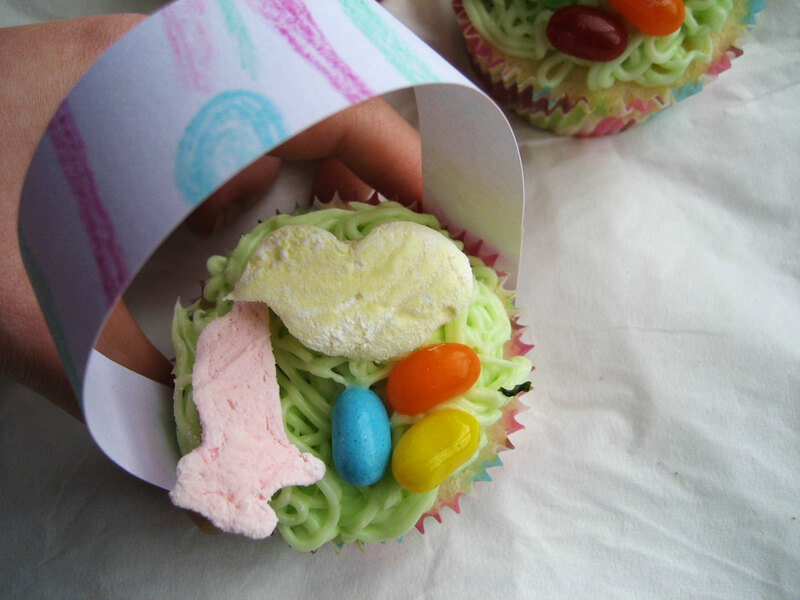 That's supposed to be grass underneath the candy, not green spaghetti. Oh, right, Easter too. I’m really just here for the jelly beans, though. Originally in my head, these cupcakes were supposed to have tuile cookie handles. But I ran out of time and didn’t bother. Poor excuse for a handle. I made some paper ones, even colored them to match the cupcake papers. But I couldn’t come up with a good way to attach them, so I skipped them. No one seemed to mind. Some had jumping bunnies and fat little chicks. I did consider making my marshmallows look a little more Peep-ish, but I got an old set of tiny farm-themed cookie cutters from my mom and had to use them. They’re very cute. And some had sitting bunnies and little duckies! The marshmallows are made from the basic recipe I use, with the addition of crushed, strained strawberries (about 3 large ones) in the strawberry bunnies, and strained Meyer lemon juice in the lemon chicks and duckies. I ended up using the juice of an entire lemon but should have used closer to half that; they are intensely lemony. 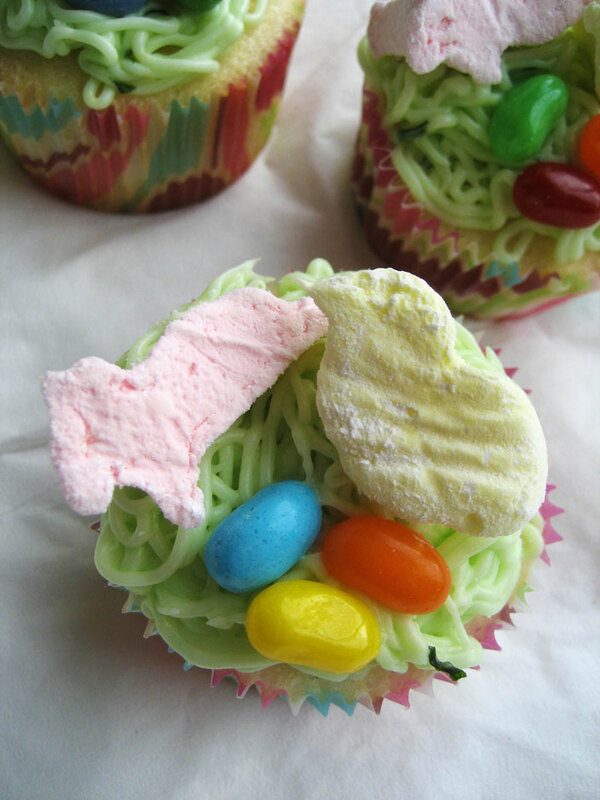 Oh, also there’s food coloring in them. But that should be obvious. The cake was so WHITE. And vanilla-y. In keeping with the lemon and strawberries theme, I stuck a piece of balsamic-soaked strawberry in each cupcake and made a Meyer lemon-basil cream cheese frosting. A word of warning: if you’re going to try to pipe any frostings with bits of stuff (say, shreds of fresh basil) in it, don’t use the “spaghetti” tip on your pastry bag. You’ll be picking bits of whatever’s in your frosting out of the holes the entire time. The cakes themselves also got a double hit of vanilla – I scalded the milk with a vanilla bean and used some vanilla sugar, which will be reflected in the recipe. If you use extract or something, you lose – it definitely will not be as vanilla-y and good. Don’t complain about vanilla beans being expensive, either – just go on eBay or Amazon and buy a bulk bag. It’s not very expensive and totally worth it. I usually have more vanilla beans than I know what to do with. Sometime I even give them away! Better than Peeps any day! Though I do still love me a stale Peep every once in a while. Pour the milk into a small saucepan. Split the vanilla bean and scrape it into the pan, then add the pod itself. Cook over medium heat until the milk just barely boils. Immediately strain it into a measuring cup and remove the vanilla pod (which you can clean and use to make more vanilla sugar). Allow the milk to cool. Sift together the dry ingredients. In a stand mixer or with a handheld electric mixer on low, cream the butter and sugar together. Alternately add the wet and dry ingredients until fully incorporated. Add the egg whites and turn the speed up to medium-high. Mix until the batter is light and fluffy. Pour into lined muffin tins and bake in a preheated oven at 350 for 10-12 minutes, or until a toothpick inserted in the center of a cupcake comes out clean. Do not allow the tops of the cakes to get browned – mine were just cooked through and completely white. Allow to cool fully before assembling. Makes 12 cupcakes. Wash and hull strawberries, and cut into 1″ pieces. Place in a shallow bowl. Drizzle with balsamic and dust with vanilla sugar. Gently stir to coat with a spoon, then cover the bowl with plastic and allow to sit out for 1-4 hours. You will have extra, as you only need 12 pieces. You can either scale the recipe back or do what I did and sprinkle the leftovers with black pepper and enjoy with a spoon. Once the strawberries are done macerating and the cakes are fully cooled, use a sharp knife to cut cones out of the cupcake tops. Trim the removed parts so that only a thin lid remains, and remove any extra loose cake on the inside. 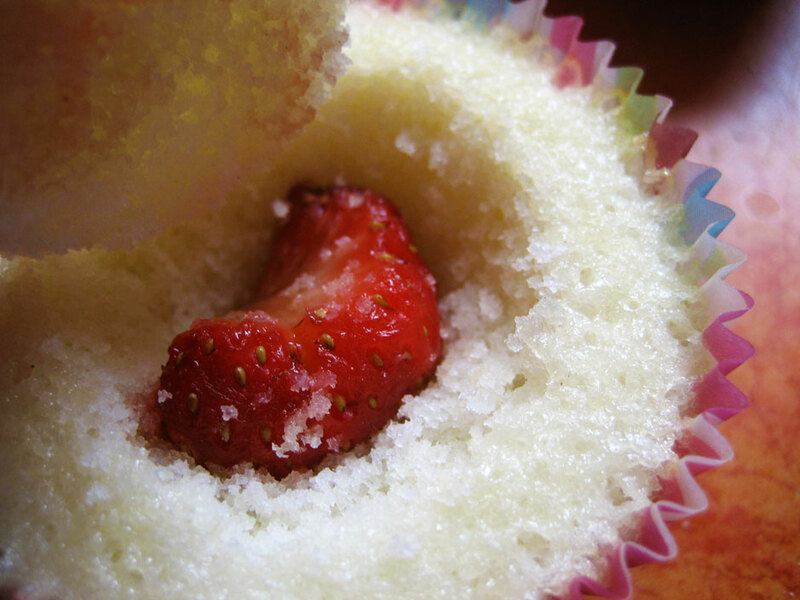 Plcae a piece of strawberry into each cupcake and cover with their lids. In a stand mixer or with a handheld electric mixer, cream together everything but the sugar. Gradually add the sugar by cups. 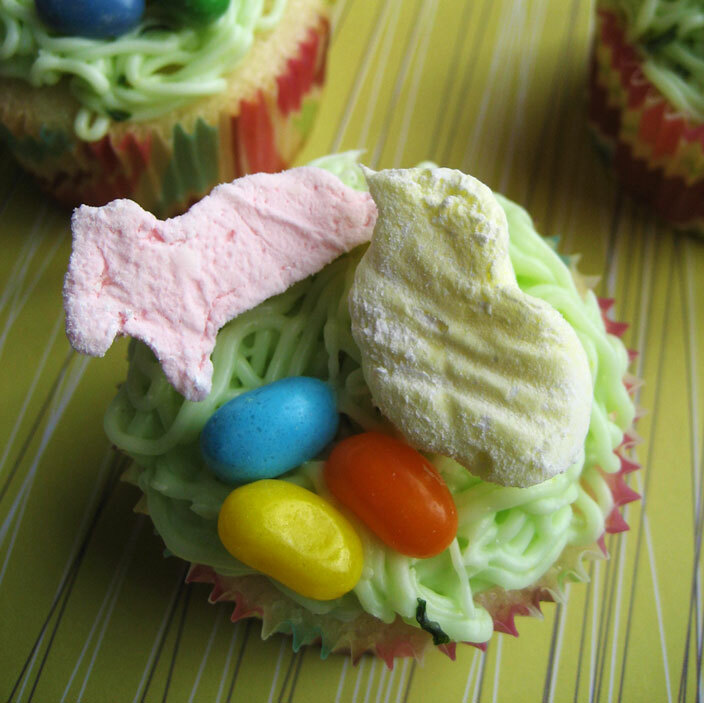 Once fully combined, scoop the frosting into a pastry bag by thirds and pipe on top of cupcakes. 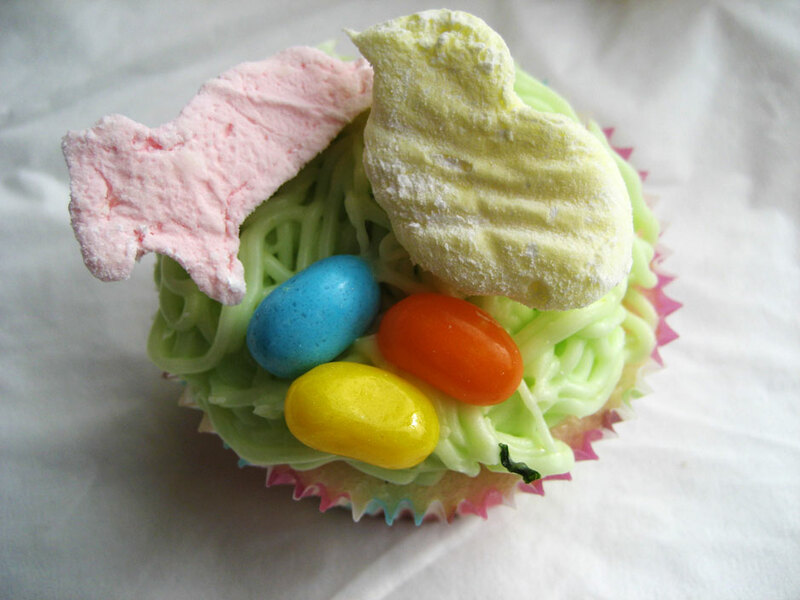 Garnish with homemade (or storebought, I guess) Peeps/marshmallow bunnies and sour Jelly Bellys (because they look the cutest). 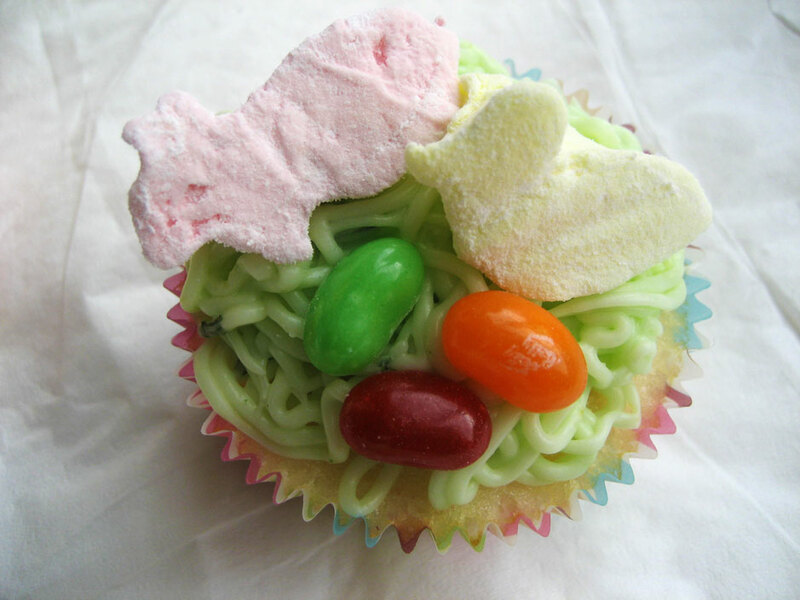 You wouldn’t expect a candy-topped cupcake to have such “grown-up” flavors in it but it’s a good match for my personal tastes – a little fresh fruit, some jelly beans and marshmallows, and a few odd little twists thrown in to make it interesting. I thought your basket of goodies was sweeter (no pun intended) than all the wonderful things you photographed in nyc. But the rabid squirrels – now they were classic! The eyes were the best part. I wish I had one right now with some hot cocoa. Love the homemade marshmallows. Next time you could make the handle out of sour straws candy or licorice ( wouldn’t be possible to hold it by this but it would look cute). I love the idea you had for your Easter Basket. When you’re as talented as that, your experience proved true when you set those up. I especially liked the one you made with the marshmallows, strawberries, and lemon. Looks so delicious!